Cleveland Area History: Wait, this Art Deco skyscraper was in Cleveland?! Wait, this Art Deco skyscraper was in Cleveland?! 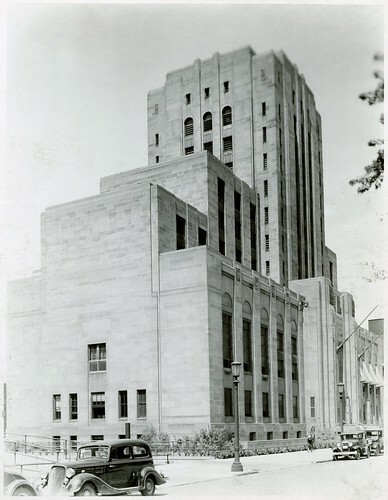 Cuyahoga County Criminal Court Building, July 1936. 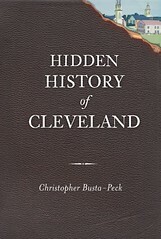 Created by the staff of the Ohio Federal Writers' Project. Image used courtesy of the Ohio Historical Society. When I first came across photographs of this building, in the documention collected by the Historica American Buildings Survey, I was sure that the caption was wrong. A building like this, in Cleveland? Surely I would have heard something about it. Surely I would have been able to find some mention of it, somewhere. As a result, the building didn't stick in my mind - I assumed it had to be somewhere other than Cleveland. 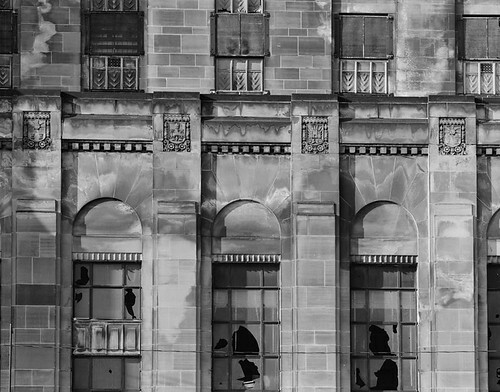 Detail of a photograph, used courtesy of the Historic American Buildings Survey. 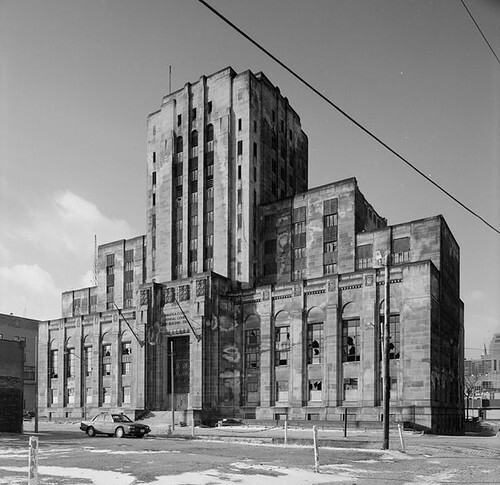 A recent reinspection of the photographs forced me to accept that this building was, in fact, in Cleveland. 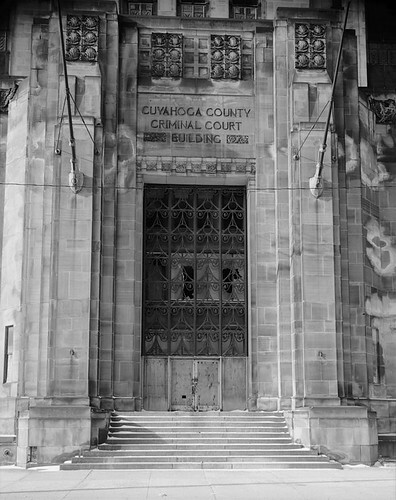 Note the text over the front door; "Cuyahoga County Criminial Courts Building". The structure, designed by Cleveland architects Warner and Mitchell, was completed in 1931. It was located at 1560 East 21st Street. 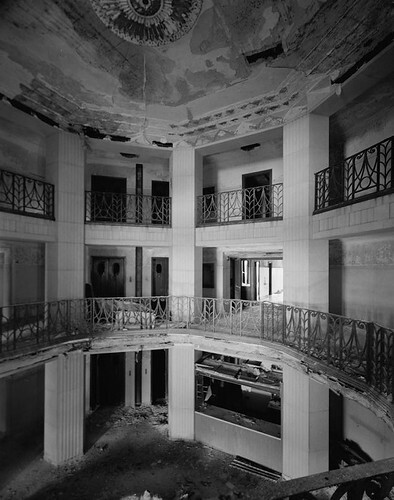 These photographs were likely taken close to the date of demolition, in the 1990s. Even then, the building retained much ornament and architectural detail. This level of detail continued inside. 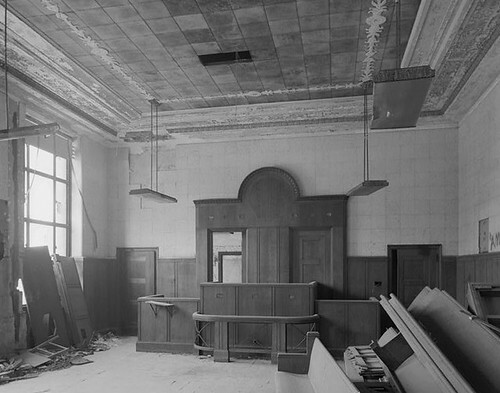 While the space shows considerable decay, the original grandeur is clearly visible. This level of detail continued into the courtrooms, which somehow remained mostly unchanged for decades. The building was replaced, leading to the decay of this structure. The Historic American Buildings Survey has more photographs - it's worth taking a look. I love that parking lot that replaced it. I shot film of it coming down--16mm footage. I'd like to see that film! Wow. That building is gorgeous. I love the railings inside. In the second picture you can see the BP/200 Public Square Building in the background, as well as Terminal Tower. I remember it clearly. It was just north of the Third District Police Station. I'm waiting for them to tear that magnificent structure down too. I have a piece of stone from the demo site. Jane Fonda was arrested in 1970 in Cleveland and processed at that location. This reminds me of Fenn Tower. Thank goodness we still have one example of this great art deco design.